Do you need Chesterfield VA bat removal services? If you have bats in your attic, bats in the gable end vents of your home, or a bat flying around in your Chesterfield Virginia home we can help safely and humanely remove the bats and help get rid of them to restore your peace of mind. Bats are commonly found roosting in gable end vents, under the siding of a home, behind shutters, in attics and in the eaves of homes and businesses. Quickly removing bats in the house is our specialty. Virginia Professional Wildlife Removal Services is the ONLY Chesterfield VA bat removal and bat control company where all of our employees are NWCOA Bat Standards Compliant AND WCT Training Group Bat Standards Certified. We perform bat exclusions, individual bat removal, bat colony removals, bat feces identification and removal, and bat guano (bat poop) removal and clean-up services throughout the State of Virginia – including Chesterfield, Midlothian, Woodlake, Brandermill, Chester, Richmond, Short Pump, Glen Allen, and Chesterfield. Bats in your attic, bats in your vents or a bat in your house? No Problem. Virginia Professional Wildlife Removal Services is registered with and recommended by Bat Conservation International as Bat Exclusion Professionals. Virginia Professional Wildlife Removal Services personnel view bats as the beneficial animals that they are, and make every effort to exclude bats from buildings in a safe and effective manner. Virginia Professional Wildlife Removal Services personnel are also knowledgeable and experienced with safe bat guano clean-up techniques and procedures. At Virginia Professional Wildlife Removal Services we are constantly striving to advance our education so that we may serve you better and provide the area’s best Chesterfield VA bat removal services. If you have a bat colony in your attic of your Chesterfield VA home, call Virginia Professional Wildlife Removal Services today at and schedule a site visit for Chesterfield VA bat removal and bat control. We can safely remove the bats from your home, and make sure that the bats do not return. We normally do not perform bat exclusions during the bat birthing period of May through August. There are exceptions, so call us for details. A bat in your house? First, if possible isolate the bat to one room, then call Virginia Professional Wildlife Removal Services and let us remove the bat for you. If the bat has made contact with any person or pet, it will need to be tested by the Chesterfield Virginia Health Department for rabies. There are three species of bats in Virginia that are Federally endangered and are therefore protected under the Endangered Species Act which explicitly prohibits anyone from attempting to harass, harm, pursue, hunt, shoot, wound, kill, trap, capture, or collect, or to attempt to engage in any such conduct any endangered or threatened species. The three federally endangered species of bat in Virginia are Gray, Indiana, and Virginia Big-Eared. Before implementing any control technique, ensure that your problem bat is not one of these three endangered species of Virginia bats. There are 16 species of bats in Virginia. Three (Gray Bat, Indiana Bat, and Virginia-Big-eared Bat) are federally endangered. One, the Rafinesque’s Big-eared Bat, is state endangered, and the remaining 12 are non-game protected species in Virginia. The Big Brown Bat, Evening Bat, and Little Brown Bat are the three bat species in Virginia that are most likely to take residence in a building. To help identify the species of bat you may have, use the county occurrence map for each species found on the Virginia Department of Game and Inland Fisheries website. The county occurrence maps represent counties that have been documented to contain that particular species. The occurrence maps do not indicate the only areas that a particular species may be found but they are a good way to identify the species that you are likely to have. Pay particular attention to the threatened and endangered species, management options may be limited due to federal and state laws. In Virginia bats are not considered a game species or a fur-bearing species. This means that a bat may be killed if it is deemed as being a nuisance to a homeowner. The Virginia Department of Game and Inland Fisheries (VDGIF) defines nuisance as species found committing or about to commit depredation upon ornamental or shade trees, agricultural crops, wildlife, livestock or other property or when concentrated in numbers and manners as to constitute a health hazard or other nuisance. However, the term nuisance does not include animals designated as endangered or threatened. The mere presence of a bat does not constitute it as a nuisance. Other legal aspects that the homeowner needs to know is that it is illegal to poison any animal (including bats) with the exception of mice and rats found in a dwelling (4VAC15-40-50). It is also illegal to transport any bat species therefore making it illegal to relocate any species of bat other than on the property on which it was caught (4VAC15-30-50). If a bat is found indoors with people, the Chesterfield Virginia Department of Health recommends having the bat captured and having it tested for rabies. While less than ½ of 1% of all bats actually carry rabies, this is a time for caution. Heavy leather work gloves should be worn if you must handle the bat in any way. Bats and their droppings (bat guano or bat excrement) should only be conducted by a licensed, trained and Chesterfield Virginia State Certified Bat Removal Company. If you have an area with a large buildup of bat guano (droppings) and you must be in the contaminated space, immediately put on gloves and something to cover your nose and mouth. Bat droppings can harbor histoplasmosis fungi spores and should be cleaned up by a professional Wildlife Removal and Animal Control Company in Virginia. Bats are great neighbors to have around the house. One little brown bat has been documented eating upwards of 600 mosquitoes in one hour! Imagine what several individuals flying around in your yard could do! There are seventeen species of bats in Virginia. The bats in Virginia are divided into two categories: cave bats and tree bats. Cave bats hibernate in caves, while tree bats hibernate in leaf clusters, under decaying logs, in hollow trees, or sometimes in abandoned mines or old buildings. There has also been an occurrence of the Brazilian Free-tailed Bat in Southeastern Virginia. Bats often fly about swimming pools, from which they drink or catch insects. White light (with an ultraviolet component), commonly used for porch lights, building illumination, street and parking-lot lights, may attract flying insects, which in turn attract bats. Unfortunately, the mere presence of a bat outdoors is sometimes beyond the tolerance of some uninformed people. Information is a good remedy for such situations. Bats commonly enter buildings through openings associated with the roof edge and valleys, eaves, apex of the gable, chimney, attic or roof vent, dormers, and siding. Other openings may be found under loose fitting doors, around windows, gaps around various conduits (wiring, plumbing, air conditioning) that pass through walls, and through utility vents. Log cabins are another type of home commonly inhabited by unwelcome bat colonies. Often times the chinking in log cabins has fallen out leaving inviting entry points for bats looking for a new home. Give us a call if you need to have new chinking materials installed. Bats are able to squeeze through narrow slits and cracks. For purposes of bat management, one should pay attention to any gap of approximately 1/4 x 1 1/2 inches (0.6 x 3.8 cm) or a hole 5/8 x 7/8 inch (1.6 x 2.2 cm). Such openings must be considered potential entries for at least the smaller species, such as the little brown bat. The smaller species require an opening no wider than 3/8 inch (0.95 cm), that is, a hole the diameter of a US 10-cent coin (Greenhall 1982). Openings of these dimensions are not uncommon in older wood frame structures where boards have shrunk, warped, or otherwise become loosened. Log cabins are also favorite roosting sites for bats looking for safe harborage. Because of their design, log cabins have many gaps and openings that allow for easy entry for bats. Sometime these log cabins have missing chinking or the entire log cabin may need to be re-chinked using only the best chinking materials available. We can help, our bat removal experts can bat proof your log cabin, home or business so that bats cannot reenter the structure. We are Chesterfield VA bat removal experts! 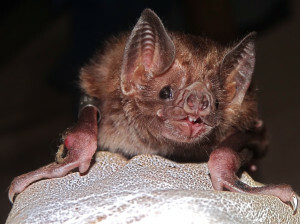 Rabies – Bats are distinct from most vertebrate pests that inhabit human dwellings because of the potential for transmitting rabies — a viral infection of mammals that is usually transmitted via the bite of an infected animal. Rabies does not respond to antibiotic therapy and is nearly always fatal once symptoms occur. However, because of the long incubation period (from 2 weeks to many months), prompt vaccination following exposure can prevent the disease in humans. Dogs, cats, and livestock also can be protected by periodic vaccinations. Bats are not asymptomatic carriers of rabies. After an incubation period of 2 weeks to 6 months, they become ill with the disease for as long as 10 days. During this latter period, a rabid bat’s behavior is generally not normal—it may be found active during the daytime or on the ground incapable of flying. Most human exposures are the result of accidental or careless handling of grounded bats. Even less frequently, bats in this stage of illness may be involved in unprovoked attacks on people or pets (Brass, pers. commun. ; Trimarchi et al. 1979). It is during this stage that the rabid bat is capable of transmitting the disease by biting another mammal. As the disease progresses the bat becomes increasingly paralyzed and dies as a result of the infection. The virus in the carcass is reported to remain infectious until decomposition is well advanced. Rabies is the most important public health hazard associated with bats. Infection with rabies has been confirmed in all 40 North American species of bats that have been adequately sampled in all of the contiguous United States and in most provinces of Canada. Bats rank third (behind raccoons and skunks) in incidence of wildlife rabies in the United States (Krebs et al. 1992). In the last 20 years, however, there have been more human rabies cases of bat origin in the United States than of any other wildlife group. Furthermore, the disease in bats is more widely distributed (in all 48 contiguous states in 1989) than in any other species. In Canada, bats also rank third (behind foxes and skunks) in the incidence of wildlife rabies. Therefore, every bat bite or contact must be considered a potential exposure to rabies. While aerosol transmission of the rabies virus from bats in caves to humans and some other mammals has been reported, this is not a likely route of infection for humans entering bat roosts in buildings in temperate North America. Histoplasmosis – Histoplasmosis is a very common lung disease of worldwide distribution caused by a microscopic fungus, Histoplasma capsulatum. Histoplasma exists in nature as a saprophytic mold that grows in soil with high nitrogen content, generally associated with the guano and debris of birds (particularly starlings, Sturnus vulgaris, and chickens) and bats. Wind is probably the main agent of dispersal, but the fungus can survive and be transmitted from one site to another in the intestinal contents of bats, and also in the dermal appendages of both bats and birds. The disease can be acquired by the casual inhalation of windblown spores, but infections are more likely to result from visits to point sources of growth of the fungus. Relative to bats, such sources include bat roosts in caves, barns, attics, and belfries, and soil enriched with bat guano or bat excrement. Numerous wild and domestic animals are susceptible to histoplasmosis, but bats (and perhaps the armadillo) are the only important animal vectors. Unlike bats, birds do not appear to become infected with the fungus. Both the presence of guano and particular environmental conditions are necessary for H. capsulatum to proliferate. In avian habitats, the organism apparently grows best where the guano is in large deposits, rotting and mixed with soil rather than in nests or in fresh deposits. Specific requirements regarding bats have not been described, though bat roosts with long-term infestation are often mentioned in the literature. While histoplasmosis in the United States is particularly endemic to the Ohio-Mississippi Valley region (which is also an area with the greatest starling concentration) and areas along the Appalachian Mountains, it is also found in the lake and river valleys of other states. Outside areas with “appropriate” environmental conditions, there also occur scattered foci with high infection rates usually associated with caves inhabited by bats or birds. When soil or guano containing H. capsulatum is physically disturbed, the spores become airborne. Persons at particular risk of histoplasmosis of bat origin include spelunkers, bat biologists, pest control technicians, people who clean out or work in areas where bats have habitually roosted, and people in contact with guano enriched soil — such as around the foundation of a building where guano has sifted down through the walls. Infection occurs upon inhalation of spores and can result in a variety of clinical manifestations; severity partially depends on the quantity of spores inhaled. The infection may remain localized in the lungs where it may resolve uneventfully; this is the case for about 95% of the 500,000 infections occurring annually in the United States. Such infections are identified only by the presence of a positive histoplasmin skin test and/or calcified lesions on routine radiographs. Other individuals may have chronic or progressive lung disease requiring treatment. Less severe forms of these infections may be accompanied by fever, cough, and generalized symptoms similar to a prolonged influenza. Resolution of the disease confers a degree of immunity to reinfection. In addition, resolution confers varying degrees of hypersensitivity to H. capsulatum; as a consequence, massive reinfection in highly sensitized lungs may result in a fatal acute allergic reaction. Q. We have noticed Bats in our attic, and have Bed Bugs too. Could the two problems be related? A. Yes, these two problems are related, but chances are you have Bat Bugs instead of Bed Bugs. Bat Bugs are a ectoparasite that be found on Bats, in guano, areas where there has been bat colonies, or around roosting areas where bats congregate. They look exactly like bed bugs, and only the trained eye can distinguish the two. Infestations can be very minor to very major problems. Once Bats are removed or happen to take up a roost elsewhere, ectoparasites like bat bugs can start searching throughout the home for a new host. If you notice activity like this call one of our Chesterfield VA Bat Removal specialists immediately. Q. How do I get rid of bat bugs? A. In most cases bat bugs will die off once their bat hosts (the bats in your attic and walls) have been removed from your property. In cases with severe bat bug infestations our trained bat bug experts can treat the affected areas to expedite and kill off any remaining bat bug pests that may be looking to “feed” on unsuspecting human hosts. Let us rid your property of these parasitic pests. Want to know how to get rid of bat bugs? Give us a call, we can help. Q. What does it cost to remove bats from attics? A. One of the first questions we get asked by potential customers is, What does it cost to remove bats from the attic of my Chesterfield, Virginia home. The truth is, no two bat jobs are the same, so the cost can vary significantly from one job to the next. We often tell callers that any company that gives you a cost for bat removal without first conducting a site visit or assessment has not a clue what they are doing. You should stay away from these so called “bat experts” and remember Buyer Beware. Q. What is the normal Chesterfield VA bat removal cost? A. Because there are so many variables in bat remediation, the cost for a complete bat removal job including sealing entry points and repairs necessary to keep bats out can range from a few hundred dollars to several thousand dollars. Q. How do you do bat removal yourself? A. Chesterfield VA bat removal requires a great deal of expertise. We do not recommend that amateurs attempt to remove bats. We also do not recommend hiring a pest control company to remove bats. Bat removal should only be performed by Wildlife Removal companies who have professionals on staff that are trained in bat biology and behaviors, and understand the correct procedures and processes for humane bat removal. Q. Bat repellents – do they work? A. There are no know bat repellents on the market that have been proven effective in repelling bats from attics or other places in your home. Be careful of gimmicks whose sole purpose is to separate you from your hard earned money. Q. Bat removal devices – what are the most common types? A. The types of devices used for bat removal and control vary. Some bat removal devices can be used in many different situations, while others have very limited uses. Q. Do you perform residential bat removal? A. Yes, our Chesterfield VA bat removal technicians are experts at residential, commercial and industrial bat removal. We perform bat removal and bat control services throughout Virginia. Q. Bat removal products – what are the most common? A. There are many different types of bat removal products available to professional bat removal companies. They include bat nets, bat pipes, bat venting devices, one way valves, and other bat exclusion tools and equipment. Q. I need bat removal and bat prevention services in Chesterfield, Virginia. What should I do? A. First, never try to do bat removal yourself. Too many things can go wrong. Secondly, never hire a pest control company to perform bat removal. Pest control companies are experts in bug control, not bats. Lastly, when looking to hire a bat removal company in Chesterfield Virginia, make sure they have received advanced training in bat removal. Removing bats from a home or attic is not like trying to trap a squirrel, it requires a thorough knowledge of bats and their behaviors. We understand the importance of education, training and experience when in come to bat removal. That’s why all of our Chesterfield VA bat removal technicians are double certified, having successfully completed bat training from two separate bat certification entities. Accomack County, Albemarle County, Alexandria County, Alleghany County, Amelia County, Amherst County, Appomattox County, Arlington County, Ashland, Augusta County, Barboursville, Bath County, Bedford County, Bland County, Bon Air, Botetourt County, Boyd Tavern, Brandermill, Brunswick County, Buchanan County, Buckingham County, Campbell County, Caroline County, Carroll County, Central VA, Charlotte County, Charlottesville, Chesapeake, Chester, Chesterfield County, Clarke County, Colonial Heights, Craig County, Culpeper County, Cumberland County , Dickenson County , Dinwiddie County, Earlysville, Elkton, Essex County, Fairfax County, Fauquier County, Ferncliff, Floyd County, Fluvanna County, Franklin County, Frederick County, Fredericksburg, Giles County, Glen Allen, Gloucester County, Goochland County, Gordonsville, Grayson County, Greene County, Greenville County, Gum Spring, Hadensville, Halifax County, Hampton, Hampton Roads, Hanover County, Harrisonburg, Henrico County, Henry County, Highland County, Isle of Wight County, James City County, Keswick, King & Queen County, King George County, King William County, Lake Anna, Lake Monticello, Lancaster County, Lee County, Loudoun County, Louisa County, Lunenburg County, Luray, Lynchburg, Madison County, Maidens, Manakin, Manakin-Sabot, Manassas County, Mathews County, Mechanicsville, Mecklenburg County, Middlesex County, Midlothian, Mineral, Montgomery County, Nelson County, New Kent County, Newport News, Norfolk, Northampton County, Northern VA, Northumberland County, Nottoway County, Oilville, Orange County, Page County, Palmyra, Patrick County, Petersburg, Pittsylvania County, Powhatan County, Prince Edward County, Prince George County, Prince William County, Pulaski County, Rappahannock County, Richmond City, Richmond County, Roanoke City, Roanoke County, Rockbridge County, Rockingham County, Rockville, Russell County, Salem, Sandy Hook, Scott County, Shannon Hill, Shenandoah County, Short Pump, Smyth County, Southampton County, Southwest VA, Spotsylvania County, Stafford County, Staunton, Suffolk, Surry County, Sussex County, Tazewell County, Tidewater VA, Troy, Virginia Beach, Warren County, Washington County, Waynesboro, Westmoreland County, Williamsburg, Wise County, Woodlake, Wythe County, York County, Yorktown, VA and the surrounding areas of Virginia. Bats are such an important part of our ecosystem in Chesterfield, Virginia. If you want to help preserve bats and increase their chance for survival, building a bat house is a good start. We also do bat house installations. NOTE: The Little Brown Bat is on the verge of being listed as an endangered bat species in Chesterfield, Virginia. To help protect this bat it is important to hire a bat removal company that is properly trained in identifying and protecting the Little Brown Bat which is so important to our ecosystem. Our wildlife experts also provide animal control services in Chesterfield VA. For Chesterfield animal control, Chesterfield VA bat removal or mole removal services in Central Virginia contact our Richmond office at (804) 729-0046 or toll-free at (888) 824-7383.